I am having so much FUN learning to code! The Starter League classes so far have been awesome, I walk away after every class with new insight and something substantial that we have learned. This week started with us still playing with HTML and CSS. We explored bootstrap, which is a framework to use in CSS, bootstrap is really cool. It reduces the work you need to do by 100’s of hours. It allows you to structure the layout and display the content beautifully with way less work. The bootstrap site, itself built using bootstrap, offers all the help you need to implement it. It was a revelation exploring it and seeing what it empowers you to do. We had our first real ruby playground session this week, which was awesome! 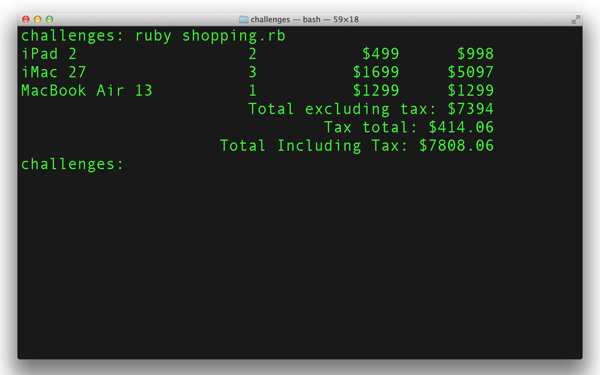 We played around with arrays and hashes and had to do a challenge to combine it all to work out sales tax on items in a shopping cart. Kelvin (also from SA) and I, were working together and we tried to do a little more by styling the output to look like a receipt. Our till slip output. Items with the tax and total. On Friday Raghu showed us how to use what we learnt in the last two weeks could be used to play with the Facebook API. It was unbelievable to see what we can already do even with the limited exposure we have had. So after class we had to get something ready for a show and tell session in the afternoon. This output all from My Facepage App. 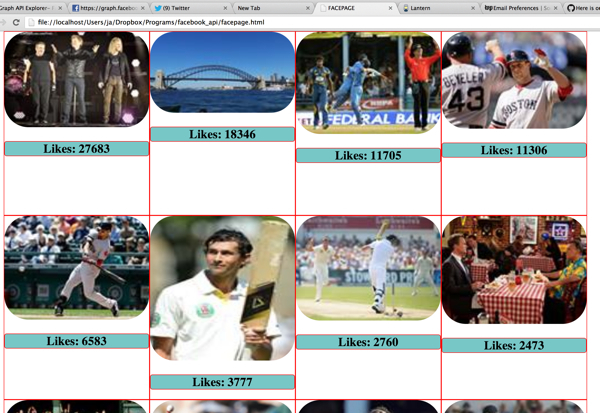 It was fun playing with the Facebook API! But Google was my friend today, so after a few trial and errors, I managed to get it working. YEA! I can already think of many times in the past where the little skills I have learned so far could have saved me so much time! This entry was posted in Chicago, Coding, Starter League on 2013/07/14 by Justinus.